STAY SICK, STAY PSYCHO! 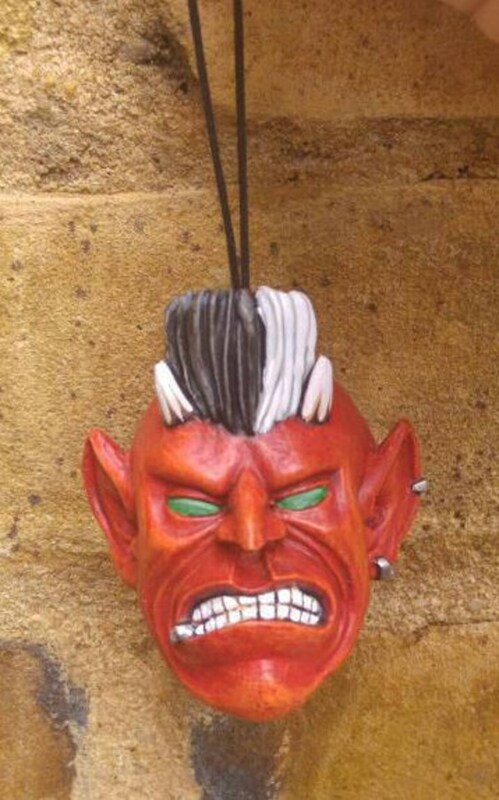 This is the 3rd Dead Head Dangler to be released, a psychobilly demon, or "Demon Ted". Sculpted with superb detail, perfect quiff and he even has "psycho" tattooed on the side of his head, totally old school! 100% handmade and hand-painted by yours truly. These nifty decorations are made from a ceramic polymer, so are sturdy and hard wearing . Can be used as car mirror decoration, rope pulls for the bathroom/kitchen/boudoir, they'd look AMAZING in your mancave, or just sitting on your record player. Trust me, you can't live without one of these! The loop can be easily removed if you so wished. Limited edition of 100. This is the red variant. Tremendous original artist who's creations I admire greatly. Very kind, and over the top talented. Thank you! Professionally satisfactory in every sense. Recommended! Love it! Really well made.